I’ve been wanting to write this for a while now but I wasn’t sure how I felt about it completely. I don’t have a problem with people who beg. I don’t know them, I don’t know their circumstances. I try and give food or money when I can. 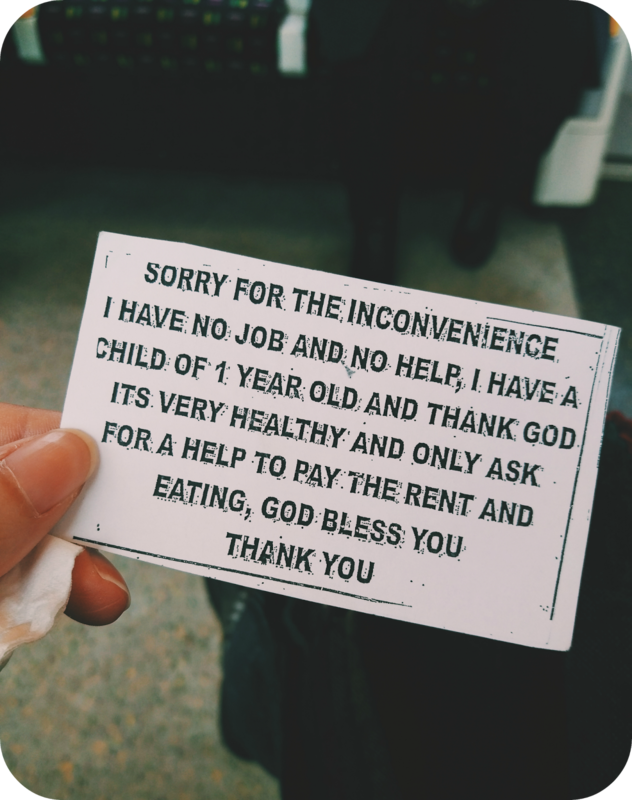 I don’t want to come across as a spoilt privileged prat that looks down on anyone but every day for the past month there is a woman who walks through the overground and underground trains with a printed and laminated card which reads something along the lines of “I am hungry, I have no food and a child to feed. Please spare some change”. *edit* after writing this post I was able to take the picture above which is a small variant of the card I’m usually presented with. This women presents as clean, very clean actually, and well dressed. She walks through the entire train approaching every single person and leaves her card beside you to have a read of it. I’ve also seen women with just the one card who stand infront of every single person with the card held up. I’ve seen fellow commuters try to pretend that they don’t see her and so she also moves the card closer or says “please” so you have no choice but to acknowledge her. Generally, I make it a point to always give change to a homeless person. Homelessness and it’s coinciding problems are just something that I feel strongly about, but this…it just doesn’t sit right with me. Is it wrong for me to get upset at this? I mean, am I being cynical? The woman doesn’t look like she is in need in any way but that doesn’t mean anything right? Someone has clearly mass produced these cards, laminated them and distributed them to these women. It’s more of a business than anything else. In a sense she’s deceiving people out of their hard earned money. Surely that’s theft? Is this organized crime? Or am I just going way too deep into this? Then I stop to think, maybe she isn’t doing this out of choice. Maybe she’s being forced to by whoever created these cards. I don’t know her story but I should at least try to find out right? So that’s what I did today. I took a seat in my usual carriage and without fail she made an appearance. Initially I didn’t notice her as I was engrossed in a book but she shoved the card closer to my face and I smiled at her. I gestured for her to sit but she stood firmly and said “please” before pointing to the card again. I asked her if she spoke English and she hesitantly said no. I asked her where she was from but she continued to ask for money. I then asked her if she was seeking asylum or was a refugee and she became frustrated, almost angry and moved on to the next person. Asylum seekers are not allowed to work and subsequently forced to rely on state benefits which is usually only around £5 a day. If I knew her situation a little better maybe I could help her a little more. Perhaps I had a problem with it because I’m concerned for her wellbeing (I help fight domestic abuse by day) or maybe it made me uncomfortable because I was sat there living my privileged life whilst someone else made me see how lucky I am. To be honest, I still don’t know how I feel about it any more than I did yesterday but I’d love to hear whether you would give money to someone with printed, photocopied and laminated cards? Have you spotted them around the London tubes?